This morning in my Convert It series, I’m sharing the adaptive reuse of the United Artist’s building and theatre in Los Angeles which was recently converted into the Ace Hotel. This theatre building was the flagship for United Artist’s Circut’s West Coast operations. The United Artist’s Circut was started when director D. W. Griffith and screen stars Mary Pickford, Douglas Fairbanks, and Charlie Chaplin broke from the studios to form UA in order to gain complete control over the creation, production and distribution of their work. The building, built in the mid 1920’s in the Spanish Gothic style, includes a thirteen-story steel-framed office tower which was designed by Albert R. Walker and Percy A. Eisen, and the UA theatre designed by C. Howard Crane. 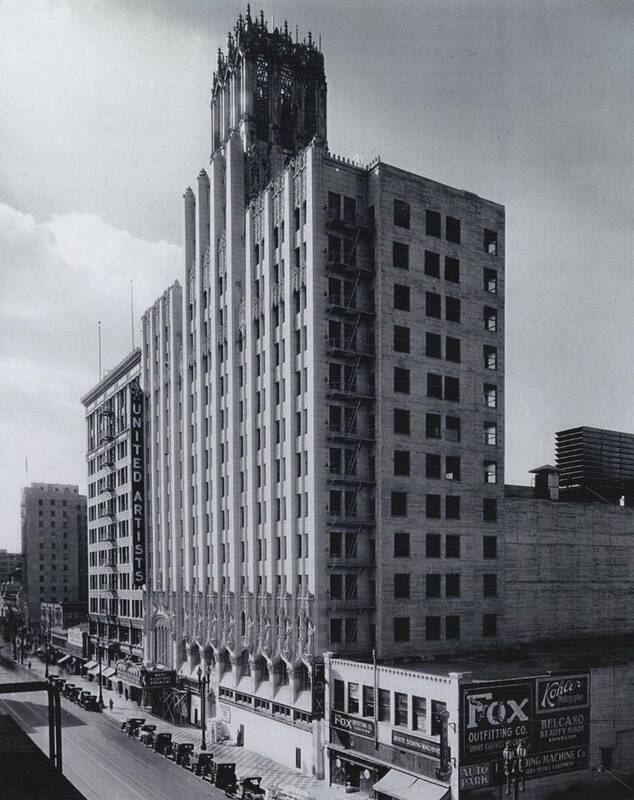 The office building above the theater was occupied for many years by Texaco. In 1989, the building was bought by the University Cathedral Church of Dr. Gene Scott, and it served as the headquarters of the church until 2011. You will note on the right side of the picture below, sticking out from the back of the building part of a “Jesus Saves” neon light that is a remnant of the previous owner, which remains there today. The restoration and design the new Ace Hotel was led by the LA design collective Commune. From the modern style rooms to the morrocan-esque rooftop patio, they have merged the gothic/early art deco feel with a modern LA hipster vibe. And surprisingly, it works really, really well. The newly restored 1600-seat theatre. An amazing upgrade and re-design. I love the entryway, the interesting lighting and the super stylish rooftop patio. It is no surprise that this adaptive re-use project won the LA Conservancy Preservation Award this year. You can learn more about the history and significance of the building on the LA Conservancy website. And you can find a lot more pictures of the hotel and theatre space in the posts by Remodelista (here and here), and Curbed.